Counts #1, #2, and #8 must be dismissed because the charges do not conform with Section-196(1) and Second Schedule of the Administration of Criminal Justice Act of 2015 (ACJA-2015). The cited section and schedule in the ACJA require that every charge must include the date, year, and location of the commission of the offense for which the accused is being charged. When it comes to the specificity of time of the commission of an offense, there is no provision for the term “Diverse Dates“ either in Section-196(1) or in Second Schedule of ACJA-2015. Secondly, Section-43 of CAP-C38 requires that an accused person is no longer triable for treason and related felonies after two years from the stated date of commission of the offense. It is because of this same Section-43 that, today, Muhammadu Buhari is not being tried for treason which he committed on December 31, 1983. 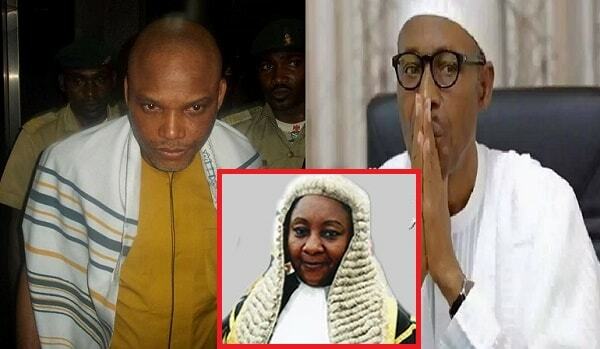 Without a specific date of commission of the offense, how then can the prosecution prove that two years have not elapsed as at the time of commencement of this case in Binta’s court? In addition to dismissing these three counts, we urge Justice Binta Murtala–Nyako to indict, convict, and jail the prosecution for committing a crime punishable under Section-118 of CAP-C38. The fake fraudulent British experimented expired Islamic State Nigeria is such a worthless meaningless and sad country!!! In all indication, Biafrans are no more interested in Nigeria. For me personally, i dislike Nigeria with passion. So it is senseless forcing Biafrans to remain in this evil contraption called Nigeria. We are not Nigerians and we can never be. We are Biafrans and Biafra is our last hope on earth. UNITY BY FORCE IS SLAVERY. So you can not force the peaceful and hard working Biafrans to remain in this hell-fire called Nigeria. #FREENNAMDIKANU # FREEBIAFRA. I stopped being or answering a Nigerian since the 1980's when I discovered that Nigeria is an Islamic country. Biafrans of the former Eastern region now divided into Southeast and South-south who still believe in One-Nigeria or see themselves as Nigerians are either STUPID or SELFISH. Nigeria can never be one, the basis for unity does not exist at all and Nigeria will never see progress as constituted until it disintegrates into three nations.